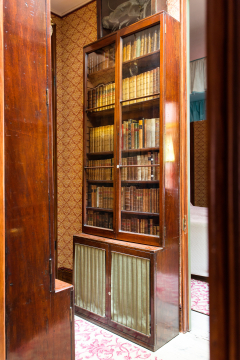 Glazed pedestal bookcase, XF32, English, unknown maker, c.1790, mahogany with brass grilles backed with green silk ©Sir John Soane's Museum, London, shown in situ, Photograph: Lewis Bush. Detail of glazed pedestal bookcase, XF32, English, unknown maker, c.1790, mahogany with brass grilles backed with green silk, detail, ©Sir John Soane's Museum, London. Photograph: Lewis Bush. One of a pair with XF33. Each has two upper doors with two horizontal glazing bars and five adjustable shelves; secure hand-made lock to upper doors; the lower doors have simple moulding around the door panels and are glazed behind the modern brass grilles backed with pleated green silk;1 the lower cupboards each have a single shelf but grooves to enable this to be adjusted. The number 121 is painted on the upper cupboard with an ivory disc numbered 34 and the lower cupboard has 122 painted above the keyhole and an ivory disc numbered 35. These bookcases were amongst those in the Breakfast Room in Soane’s first house at No 12 Lincoln’s Inn Fields and can be seen in that room in the Gandy watercolour of 1798 (14/6/1). When Soane moved into No. 13 they were relocated to the Book Passage on the second floor. They are shown in photographs from the early twentieth century relocated in the Curator's apartment. Sir John Summerson returned them to the No. 12 Breakfast Room when he restored that room in 1969-70; they were restored and the modern silk-backed brass grilles added in 1994-95 under the direction of Peter Thornton. When they were in No. 12 these bookcases were part of the furnishings of Soane’s first ‘Library’, which doubled as a Breakfast Room, and are straightforward, simple and practical pieces if not very stylish. 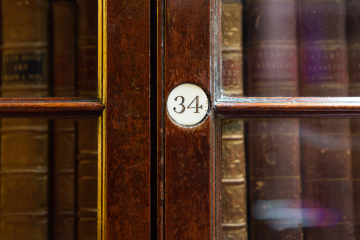 When Soane created his new Library at 13 Lincoln’s Inn Fields, such simpler furnishings were banished to the Book Passage on the second floor favour of new bookcases made by Soane’s favoured cabinet-makers John Robins or the Martyr family. In 2015 these bookcases were reinstated in their original position in the recreated Book Passage as part of Phase 2 of Opening up the Soane. 1 These were added during the restoration of the No. 12 Breakfast Room in 1994-95 under the direction of Peter Thornton to replicate those shown on these bookcases in the Gandy view of that room SM 14/6/1.